Hello there! You might be wondering about the title of this blog post. Don’t worry, everything’s legal here! With the holidays and a break from school and work, I have had the chance to dive into some cleaning and organizing projects. As I’ve been sorting and deciding what stays and what goes around my house, I’ve been thinking “Is any of this stuff worth money?” Being that it is January and not good garage sale weather, I decided to challenge myself to see if I could make at least $100 in CASH through my organizational effects. Now I am a bit lazy so I knew it had to be easy for me and most importantly, I need instant gratification. I love selling things at traditional consignment shops but this time, I didn’t wait to have to wait on a check to show up in a few months. OK so are you ready to follow along on this short yet lucrative adventure with me? Step #1: Go through your home including the kitchen, all bedrooms, couches, cabinets, family room and office with a large plastic Ziploc bag and collect coins. Don’t forget to also check your current purse and all old purses and bags that you are stowing in your closet. Step #2: Snag a large shopping bag and go through your old books, CD’s, DVD’s and games. Yes, GAMES. Do the same in all kid’s rooms, playrooms etc. Put the things your family no longer wants or needs in the bag. Step #3: Grab a large garbage bag and go through your dresser drawers and closet (including shoes and accessories) and grab anything that looks like something a teenager MIGHT wear. All those Xhiliration tee shirts from Target? Perfect. Those sassy boots that kill your feet so you only wore them once? Throw them in the bag. Do not over think this! If you haven’t worn or thought about it in a year… IT GOES IN THE BAG. Don’t get too hung up on season either. Just make sure it’s all clean, neat and tidy without stains, rips or tears. Step #4: Get in your car… you’ll be making a few short stops. STOP #1: The Grocery Store: Grab that plastic Ziploc and hit the Coinstar machine. 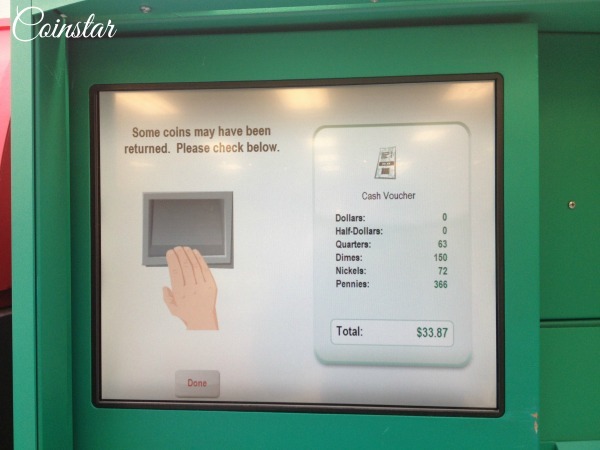 For a small fee, you can dump your coins in and… presto, you get a voucher for cash you can take to the checkout line. You can also donate the money to charity or put it on gift card for different places like Amazon.com. My score for the bag o’coins? $33.87. That’s right! Bye bye coins… Hello bills! STOP#2: Half Price Books: Bring all those old books, CD’s, DVD’s and games (that have all the pieces) along with your ID to the buying counter. They will go through your stuff and make you a cash offer which you can redeem at the front counter. You can also use it for in-store purchases. 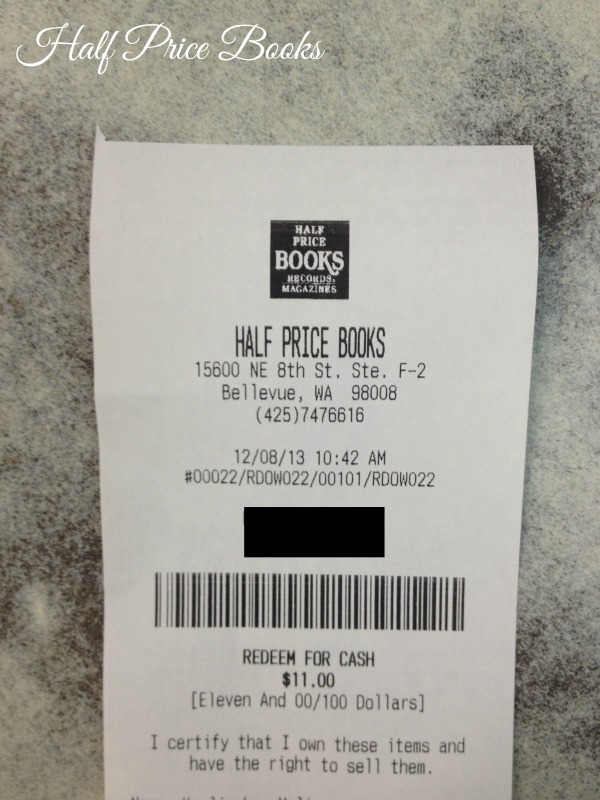 I made $11.00 unloading books etc we no longer needed. STOP #3: Plato’s Closet: This is the place that you are bringing the duds that a teenage MIGHT wear. The target customer at Plato’s Closet are teenagers (both girls and boys but more girls). However, there are tons of great clothes in there for grown-ups too. I saw rows of designer jeans (including Hudson and Seven). I also saw lots of brand new shoes that would like great on feet of any age. BUT on this particular day, I was trying to MAKE the money. I scored $65.71 in cash for two pairs of sneakers, a sweater, a belt and a few other items. My family and I used our new cash to finance a dinner at The Spaghetti Factory and a night at the movies (for four) with popcorn and candy. Even better than that was the fact I cleared out a bunch of coins, books and clothes. If you have any tips on other national chains that give you cash for your goods, please share the info in the comment section. That sounds like fun, great job. We don’t have one of those book places in our state so I did a search and found there are several others (similar) in our area. I’m also looking forward to April/May when I can sell our top-condition homeschool curricula for top dollar! My daughter has sold at Plato’s Closet (and bought a lot there too :) Glad y’all had fun at dinner and the movie. Hi Mary! That’s cool about your upcoming home school curricula sale. It feels good to make some cash from gently used items. 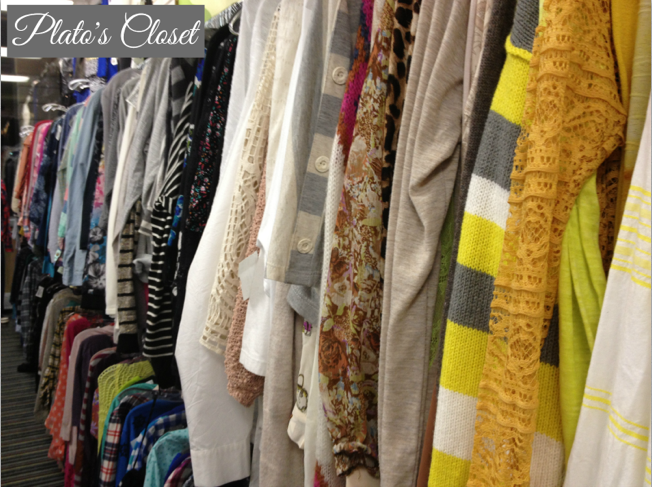 Plato’s Closet is awesome… I wish they had a version for middle aged moms! Have a great day! 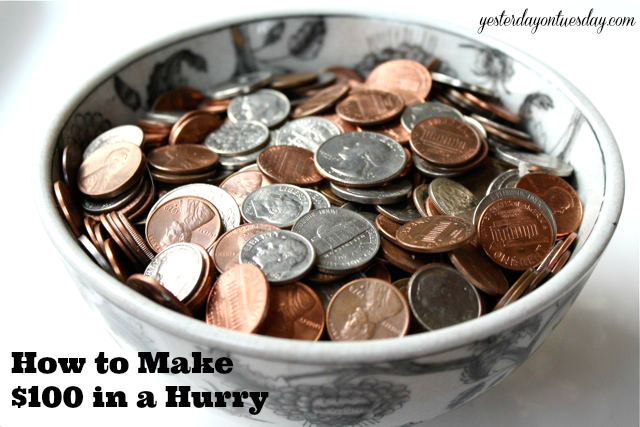 You’ll probably never miss the coins, books, DVD’s, or clothes that let you quickly make $100. We paid for tile for our bathroom floor and a new toilet by cashing in two containers of coins. It really did feel like free money! I have a bag of change ready to go in my junk drawer that’s next to my back door. I always think about cashing it in, but I don’t need it quite yet. I’ve seen Plato’s Closets around, I’ll have to check it out. Great post title! Coming from Monday Funday! Our local bank has gone all automatised its a real pain except they take and count cash into machine so no fees straight into your bank account. It might annoy a few people behind counting pennies but its great. amazon and barnes and noble will also buy your old books and maybe even old electronics, kindle,nook,ect and pay you for them.